Guys and girls, we’re less than two weeks away until the start of the NSWWA Severne Wave Series 2012-13!! Event One takes place at Port Kembla; a great location for westerly winds which theoretically is the predominant wind at this time of year. Having said that, and if you look at the graphs for this week we could be holding the event at Gerroa (if North East wind) or Windang (Southerly wind). Please aim to arrive at King George V Park, Port Kembla (by the surf club – you will see flags) for 9:30 although sign on is until 11am. Keep an eye out on here and seabreeze for the latest news – we can change the location and time of rego on the day to get the best wind/waves possible. We had mentioned a potential for a BBQ bacon ‘n egg breakfast but we have decided logistics will be too hard. So, we will be doing an evening event – keep an eye out on the whiteboard for location. 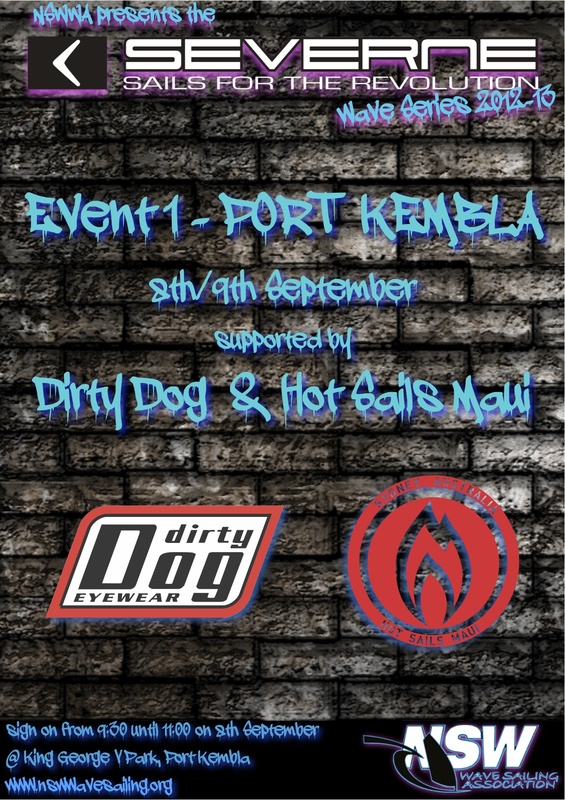 Dirty Dog, a long term supporter of our Association are the headline sponsors for this event with our newest sponsor Hot Sails Maui. Severne have kindly come on board as Series Sponsor for 2012-13 which is great news. As an FYI, Hot Sails Maui are sponsoring the Juniors for the whole season – so if we get enough contestable events (and enough juniors entering) gear will be up for grabs to the winners and most improved*. Bring your kids/mates! Fingers crossed for wind and the end of this flat spell! See you all at Port Kembla.